I remember shop class fondly even if the 8th grade version of myself was not very skilled at measuring and cutting. Everyone in class made wooden napkin holders and bent sheet metal into toolboxes using rivets. It was fun but it was a single class and we were never invited back to the shop once we finished. Today, many schools (that have funds) are creating FabLabs, or Fabrication Laboritories or Makerspaces, for students to learn how to make their ideas real while learning how to use a 3D printer, a laser cutter, a CNC or milling machine and make little robots using motors, sensors and microcontrollers (tiny computers). The classes in the FabLabs will teach students concepts and software related to 3D modeling, controlling simple electronics and simple wood working techniques. The work is amazing considering my napkin holder , these students are learning how to use the bits and mechanisms of our physical and digital world to create their world. 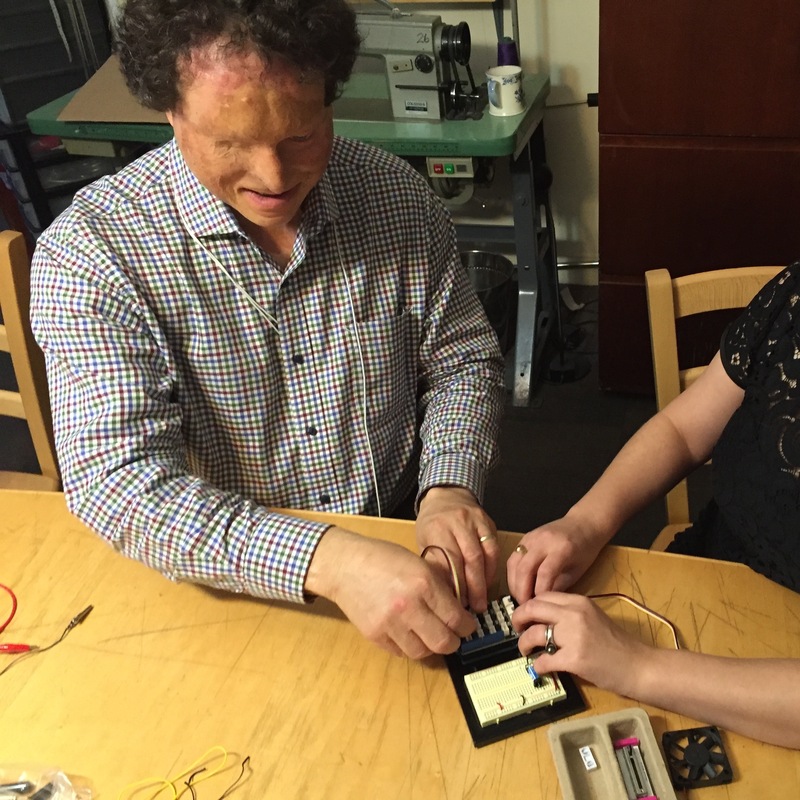 This is exciting for many reasons but to us at DIYAbility we see the potential for everyone regardless of abilities to make their world and these new tools are the first step. Because many of these tools are controlled from a computer a person who uses assistive technology to access a computer can take control and make their ideas real. One maker with physical impairments might use a head mouse to control input with head movements, another users might use voice control software. Another blind maker might use a screen reader to program an Arduino and another maker might use a single switch to scan Adobe Illustrator while preparing the vectors for a laser cutter. 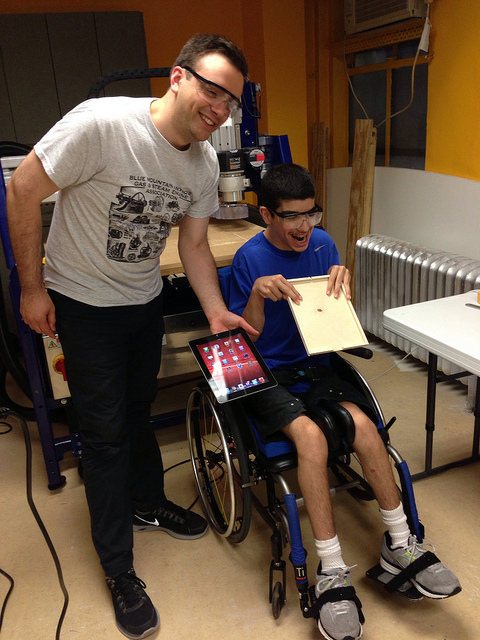 At our workshop we taught a young man with CP to use our CNC machine to make an iPad holder. His physical movements are limited but he’s a computer savvy teenager that uses the trackpad, he learned how to design and program the CNC to cut out his custom design. We’ve hosted blind makers to discuss OpenSCAD, a text based 3D modelling tool and printed sample geometric shapes to demonstrate how non visual 3D printing works. We taught a group of disabled makers about Arduinos and servo motors and how to control them, their inventions includes page turners and bell ringers. The future of Maker culture is not limited to those who can use their hands and lift scrap metal off the street, we are working to make sure disabled makers have their say relating to accessibility of tools and software and can learn the possibilities of how this new technology can work for them to make their world. If you make tools or software for STEM education we’d love to support you in making your products more accessible, email us at [email protected].